Living Values Education is a ‘not-for-profit’ organisation and provides 'download' materials free of cost. We simply ask you to login, give your email address, and ask a couple of questions that allow us to know how and where the material is being used, and if we can assist further. Your information is secure and only used by Living Values Education. Please know that by downloading the materials you are accepting to receive our quarterly newsletter, which you can unsubscribe if you choose. For Values assistance contact us - click here to email - or your closest Associate or Focal Point found in the Contact Us section. On this page you will find a storehouse of Living Values Education materials for a variety of use. Designed to address the whole child/person, Living Values Education activities engage people of all ages in exploring, experiencing and expressing values so they can find those that resonant in their heart, and build the social and emotional skills, which enable them to live those values. The universal values explored are of Peace, Respect, Love, Cooperation, Happiness, Honesty, Humility, Responsibility, Simplicity, Tolerance, Freedom, Unity and more. 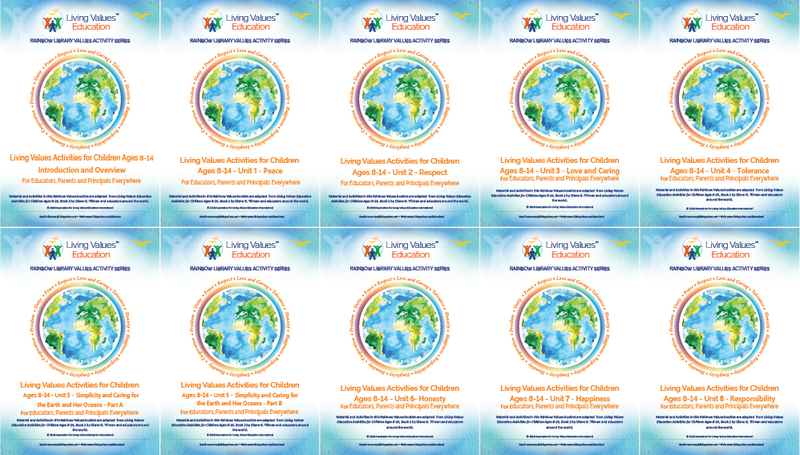 As we want you to be able to use the updated and expanded Living Values Education Activities for Children Ages 3–7, Book 1 right away, we are making the two introductory chapters and the first values unit on peace available. The entire book will be available in December 2018. The creators of the Joy of Reading Project kindly gave permission to the Association for Living Values Education International for the posting of some of their stories on this website. The 11 stories below were chosen because of their relevance to a particular value. Each pdf file states the values unit in which the story is included; the name of the story and author are stated in the relevant lesson of the book. Permission to share these stories and make them available for free download was kindly given by the Joy for Learning Project. As we want you to be able to use the updated and expanded Living Values Education Activities for Young Adults, Book 1 right away, we are making the two introductory chapters and the first values unit on peace available. We will add another values unit every month so that you can use it with your students throughout the year. These Living Green Values activities are intended to help young people be more aware of the importance of taking care of the Earth and her resources. Part of that process is awakening love for nature and her creatures and learning about specific ways that they can help be a friend to the Earth. Free Download - eBook download for reading online or self-print option and copying. Provide Activities For Everyone - Teachers, Care Givers, Parents, Individuals, Special Interest Areas, Living Values for Self and Community Development. These simple booklets, most with between 48 – 56 pages, can be photocopied for classroom or home use in "booklet" A5 form – ie regular A4 folded (to half size) and stapled. Booklets as in the "Living Values Education Distance Home Study" and accompanying "Personal Journal" with more than 80 -100 pages are required to be copied as A4 (full page) on both sides. 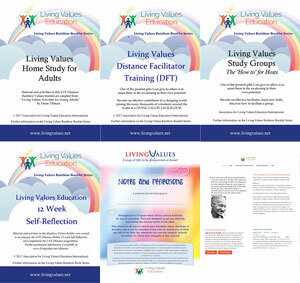 Living Values Education Distance Distance Home Study For Adults, Families and Groups - a colourful 52 page Rainbow Booklet - participation book of activities, drawn from Living Values Education for Young Adults. This 20 page Guide delivers all the techniques and skills required to feel confident to facilitate activities and workshops using Living Values Education these materials with community groups, schools, families etc. The Gude provides professional advice, recommendations as to how to be a successful facilitator, something quite different from a teacher, in that a facilitator draws out while a teacher puts in.